Aztec Enterprises, Inc. leased 1,396 SF of office space at 12510 E Iliff Ave Suite 230 for 5 years. Matt Kulbe and Anthony Damico of NavPoint Real Estate Group represented the landlord. This lease was executed in June. Warrior Challenge Arena leased 7,024 SF of industrial space at 3400 Industrial Lane Suite 12A & 12B for 7 years. Matt Kulbe and Anthony Damico of NavPoint Real Estate Group represented the landlord. This lease was executed in April. Ocean Front Corporation leased 2,450 SF of industrial space at 624 Atchison Way Suite 103 for 3 years. Matt Kulbe and Anthony Damico of NavPoint Real Estate Group represented the tenant. This lease was executed in May. Kent Shirley, Farmers Insurance leased 1,300 SF of retail space at 3980 Limelight Ave Suite C for 5 years. Matt Call and Ian Elfner of NavPoint Real Estate Group represented the Landlord. This lease was executed in May. Rocky Mountain Spine and Sport, LLC leased 2,130 SF of office space at 4350 Limelight Ave Suite 100 for 10 years. Matt Call and Heather Taylor of NavPoint Real Estate Group represented the landlord. This lease was executed in April. Yumbana, LLC leased 5,780 SF of industrial space at 651 Topeka Way Suite 500/550 for 5 years. John Witt and Anthony Damico of NavPoint Real Estate Group represented the landlord. This lease was executed in May. Qwikway Dent Technology, Inc. leased 5,000 SF of industrial space at 680 Atchison Suite 400 for 4 months. Anthony Damico of NavPoint Real Estate Group represented the landlord. This lease was executed in July. SCL Mortgage, LLC leased 1,255 SF of office space at 103 Fourth Street Suite 220 for 2 years. 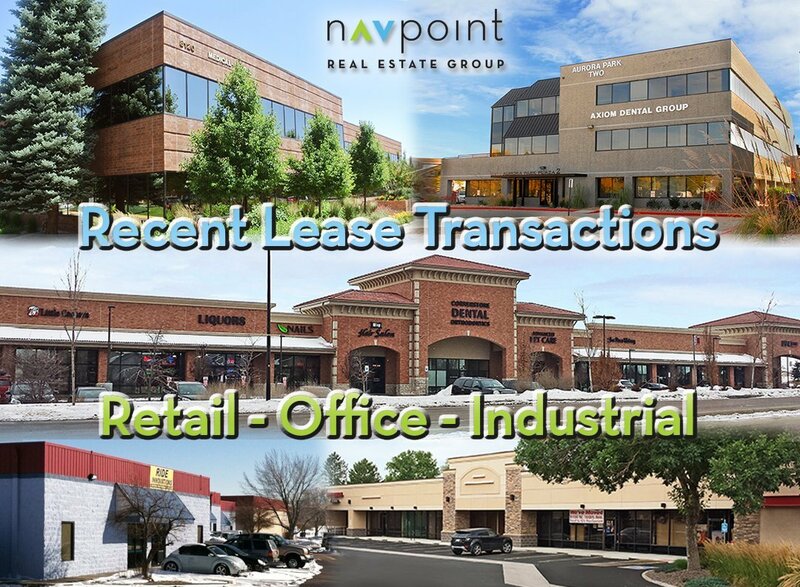 Anthony Damico and Matt Call of NavPoint Real Estate Group represented the landlord. This lease was executed in June. Headliners Music Production, LLC leased 3,596 SF of retail space at 8200 S Colorado Blvd for 5 years. Heather Taylor of NavPoint Real Estate Group represented the tenant. This lease was executed in May. Colorado Springs Oral and Facial Surgery, PLLC leased 3,844 SF of office space at 3100 N Academy Blvd #200 & 213 for 5 years. Matt Call and Brent Ham of NavPoint Real Estate Group represented the landlord. This lease was executed in June. Hi-Tech Paintless Dent Removal, Inc. leased 10,261 SF of retail space at 5706 Carefree Circle for 5 years. Matt Call and Anthony Damico of NavPoint Real Estate Group represented the landlord. This lease was executed in August. Parker Inhabet leased 1,424 SF of office space at Crescent IV 8490 E Crescent Pkwy # 380 for 3 years. Matt Call and Brent Ham of NavPoint Real Estate Group represented the tenant. This lease was executed in August. Panterra Energy LLC leased 4,000 SF of industrial space at 6900 Highway 86 for 1 year. Matt Call and Anthony Damico of NavPoint Real Estate Group represented the landlord. This lease was executed in July. Blue Horizon Therapy, LLC leased 1,989 SF of office space at 8 W Dry Creek Suite 210 & 212 for 5 years. Matt Call and Heather Taylor of NavPoint Real Estate Group represented the landlord. This lease was executed in July. Erin Bennetts, LLC & Kelly Miller, LLC leased 1,084 SF of office space at 8 W Dry Creek Suite 208 for 3 years. Matt Kulbe of NavPoint Real Estate Group represented the tenant. This lease was executed in August. Keo Yarangsky & Victor Yarangsky leased 1,488 SF of Industrial space at 11480 N Cherokee Street Unit F for 2 years. Heather Taylor and Matt Kulbe of NavPoint Real Estate Group represented the landlord. This lease was executed in August. KRH Flaming Subs 2 LLC dba Firehouse Subs leased 1,800 SF of retail space at Superior Square SEC McCaslin and Superior Plaza for 10 years. Ian Elfner of NavPoint Real Estate Group represented the tenant. This lease was executed in July. IHOP leased 7,100 SF of retail space at Northglenn Marketplace 221 W 104th Ave­­­­ for 20 years. Ian Elfner of NavPoint Real Estate Group represented the tenant. This lease was executed in May.